My kids will be home for winter break beginning Monday, so in an effort to keep them from being glued to the television for two weeks, I’m trying to get a little crafty with how they spend their time indoors. I created Battleship Game sheets from artwork found on an old game tablet (circa: long before Milton Bradley.) Using two clip boards, I will adhere a sheet to each board and clip down a sheet of clear acetate. Then my kids can play over and over again on the same boards using dry-erase markers on the acetate without damaging the original printout. Click on either image above to download the PDF files for download, one large 8.5″ x 11″, or two that fit on letter-size paper. There are a few ways to play Battleship, but I prefer the current game board method of which instructions can be easily found on the internet HERE. Enjoy! 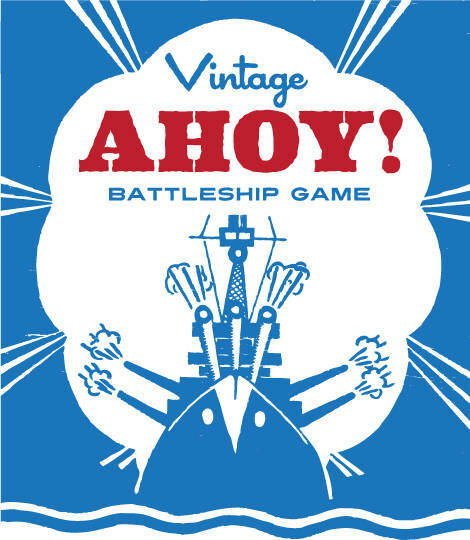 This entry was posted in Free PDF files, free vintage art, Games and tagged Ahoy, Battleship Game, Games for Children. Bookmark the permalink. How creative! We still have the actual game itself. Have fun this next week. there is absolutely NO end to your brilliance. maybe my kids can teach me this game finally. That is such a great idea! I scored two boxes of overhead sheets at Goodwill and this is a great use for some of it. My 7 year old son and my Grandmother (his great-grandmother!) like to play Battleship with each other. 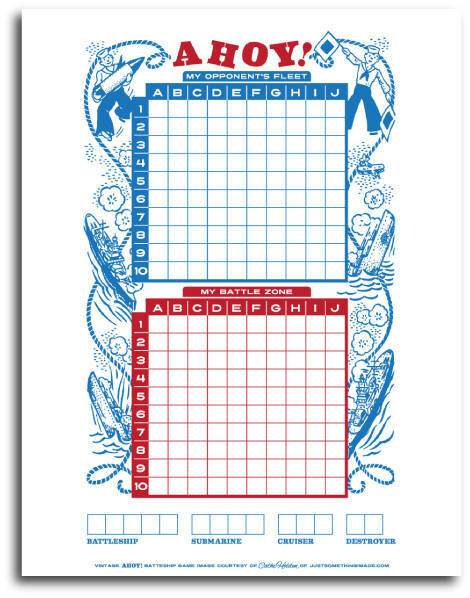 My Grandmother told me how she and my Grandfather used to play Battleship on paper, before they got the board game. I’m going to print these out and show them to her. She’ll get a kick out of it! Thanks! Thanks for sharing, I have a few little friends and some big that will really enjoy this! I love these! How imaginative! They should have hours of fun with these. Have you considered laminating them? That also looks like a great travel game. Oh what a refreshing change from electronic games and even games full of plastic bits. I think I might make one for my hubby for Christmas! Neat! This would make a fun stocking stuffer. You are so clever and talented! I really love this. I imagine my son and I playing this dear game next week. Thank you! This is a great idea! Our grandkids families travel a LOT, and this would be great as a travel game! Thank you! I love these! Thank you! I love this site!!! The products, the colors, and the ideas. I just downloaded the sewing cards, and can’t wait to use them with my twin graddaughters. These re also more fun at parties and play dates than the usual things kids get to do. This is amazing… I LOVE IT!!! Thank you so much for sharing this! This is a great idea – I am going to laminate them and put them in a little bag with things to do on a train journey…. These are awesome! Thank you so much for sharing them. 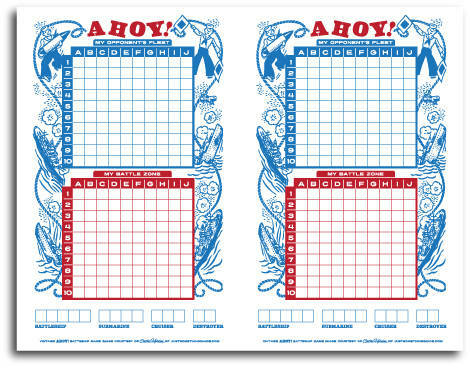 Cool – I love these old battleship sheets. thank you so much. this will be perfect for our summer road trip to seattle!!!!! The Battleship game has 5 ships. Your game has only 4. This is really cool. I’ve thought about making something like this myself. Yours probably turned out nicer that mine would have. But I’m curious if you have any pictures of the original game that inspired you? I’d love to see that too. This is just gorgeous, thank you. My Year 2 class (8 years old) will be giving this a go on Monday! I have an original book.